Nearly 1000 people attended Sheffield Hallam University's maths day last Saturday, including a session on juggling. David Bocking watched the fun. LET'S talk about space time theory, synchronous patterns, negative numbers, the Special Theory of Relativity, numerical sequencing and the relevance of mathematical modelling. Dr Colin Wright is hurling a number of balls around the Pennine Lecture Theatre of Sheffield Hallam University. "When I was first learning to juggle I could do three balls in a circle and a friend of mine said he could do five. So I shot him," says Dr Wright, speaking from his relaxed position under an array of swirling spheres. He narrows his eyes. "Never mess with a mathematician." It's National Science Week and Colin Wright, unicyclist, juggler, fire breather and doctor of pure mathematics (Cambridge University) is giving a talk on mathematical modelling, numerical sequencing (/etc/ - see above) while juggling in front of 400 rapt children, parents and mathematicians. "If they're easy to catch they're easy to catch," he explains, catching easily. Maths teaching is suffering a bit of a crisis at present. Despite the successes of the numeracy hour, secondary school pupils still have difficulty with algebra, maths teachers are dwindling (the number of qualified maths teachers in the UK has halved over the last 20 years) and AS maths failure rates are twice that of other subjects. Nevertheless, nearly 1,000 people attended Sheffield Hallam University's maths day last Saturday, which included the talk by the juggling Dr Wright, who has clearly hit on a revolutionary new theory of his own: maths is fun. In his case the practical demonstration of this theory came to the fore during a visit to a pub with members of the Cambridge University Juggling Society. 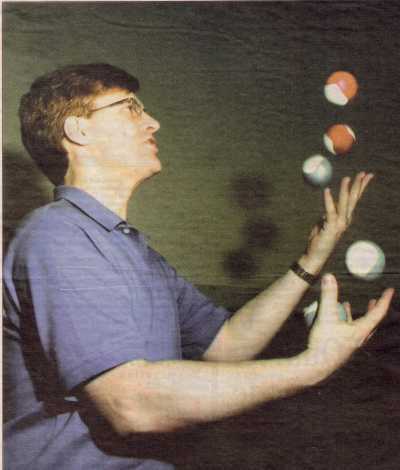 When he first went along to the society evening as a novice juggler and unicyclist in the 1980s Colin thought there'd be people trying to juggle with as many balls as possible. (He's since managed seven, he says after the lecture, for 21 catches. It takes a lot of practice, he says). "But most people were just trying to do strange things with three balls," says Colin. After learning to do a few strange things with three balls himself, he and his fellow scientific jugglers began to wonder how they could make a note of their strange things for posterity. So they went to the pub and came out with their first sketches of a unified theory of juggling notation. Bizarrely, a team of mathematicians from universities in Santa Cruz and Colorado were simultaneously working on the same thing and now the site swap theory (based on numerical sequences, mathematical modelling, etc ... ) is the standard notation of juggling tricks. It's like reading music but for juggling, Colin explains. All this (and a pretty sophisticated set of theories and examples, if anyone noticed) is explained as Dr Wright casually throws, drops and siteswaps his juggling balls into the Cascade pattern, the Shower, Mills Mess (his own favourite) and the less memorably titled 45141. (Named after a particular combination of ball cycle times. Don't worry - if you want to know about such things, and how juggling balls can travel backwards in time, see Dr Wright's exhaustive website). Sheffield's mathematicians and jugglers from the age of eight to pensioners are enthralled. Not just by the juggling but by the fact that with a bit of lateral thinking, a little bit of maths and a lot of imagination juggling tricks can be accurately described by a simple series of numbers. The finale comes as Dr Wright invites the audience to invent a trick by adjusting a series of cycle times to their own preference and then hurls two of the balls as high as the spotlights to demonstrate the juggle concerned. There's the kind of thunderous applause rarely received after a maths lesson on mathematical modelling and numerical sequencing and Dr Wright smiles and packs away his notes and balls. "If I can save one child from a life in accountancy and turn them to do maths or science instead, then I've won."